I might take breaks from making ice cream, but I never take a break from eating it. To update my specific ice cream rankings, I'll need to add Tara's and Lush Gelato. 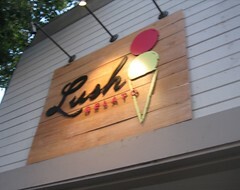 At the top of my list is Lush Gelato. I was hesitant when I was told that it was Argentine style gelato, I found many of the gelatos in Buenos Aires flavorful but too sweet for my palette. The dulce de leche at Lush was perfect for me. Excellent texture with very strong flavor. I sampled a few of the other flavors and found them just as appealing.